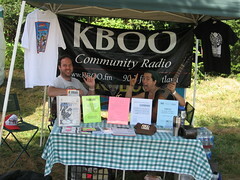 KBOO absolutely depends on volunteers to carry out the work of the station. 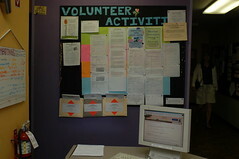 Current volunteers: Click here to go to Vicnet, KBOO's online volunteer management system, to schedule or sign up for a shift. In order to use the new volgistics system, you'll need to create your own login- just follow the prompts at that link. The first time you login, please click on "need a password". Please fill out the information in your profile, including date of birth, update your contact information, and let us know when you are available to volunteer, and what you are most interested in doing.Once you have created your own login, go to the "my schedule" tab to see a drop down list of opportunities and trainings available, then sign yourself up! Not a KBOO volunteer yet, but thinking about it? 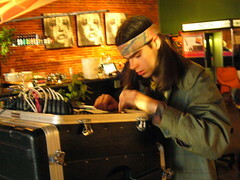 At KBOO we have a dynamic community of 500 volunteers doing everything from front desk work, janitorial work, community reporting, hosting information booths, clerical support, news writing, documentary making, engineering live music, operating sound boards, engineering and computer help, website upkeep, and many, many other things. Please fill out this Volunteer Information Sheet Form before the orientation. Contact Ani at 503-231-8032 ext. 213 or via email at volunteer[at]kboo[dot]org to with any questions regarding volunteer orienation or volunteering at KBOO. There is no pre-registration for the volunteer orientation-- just attend if you are able. Do you want to get involved? Contact Ani, the volunteer coordinator. Her email address is volunteer@kboo.org, or call her at 503-231-8032 ext. 213. Ready to submit your program proposal? Here is the form (you should have a 15-minute mp3 sample ready to upload with the form). Volunteering at KBOO can take many, many paths. We have volunteers who come in to do things a few times each year, and other volunteers who spend 20+ hours each week at the station. Our volunteers range in age from nine years old to more than 80. Our community strives for inclusivity, and includes people of many races, ethnicities, gender identities, sexual orientations, spiritual paths, economic classes, and political & philosophical schools of thought. 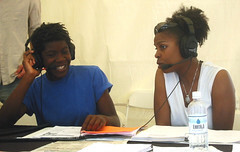 Together we make up a thriving multi-cultural community working to create fabulous radio. 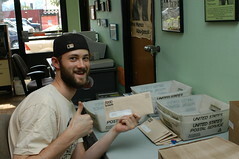 Orientations for new volunteers happen monthly, and are held at KBOO, 20 SE 8th Ave., just 1/2 block south of Burnside. Volunteers at KBOO must be able to work collaboratively in a richly diverse, often hectic environment that is committed to non-violence within all levels of the organization. Currently, our biggest needs are for: news room volunteers, distributing flyers / postering, live remote broadcast tech help, live music mixologists, audio producers, audio production trainers, clerical support in the membership office, and outreach volunteers to help with special events, and outreach information tables. If you have been to volunteer orientation and are interested in any of these roles, contact me to let me know. I will be happy to talk with you about the specific role, any training you need, and the schedule involved. If you have not yet attended an orientation for new volunteers, contact me (ani) for all of the details to get involved! Call me at 503-231-8032 ext. 213, or via email. KBOO offers training in radio production, voice and microphone skills, audio editing, and field recording for volunteers who have attended Volunteer Orientation and commit to volunteering to fill station needs. We ask that you schedule at least 8 hours of volunteerism for each class you take. Contact Ani for more details. If you've been considering volunteering, NOW IS THE TIME! If you are a volunteer and want to be sure that you are keeping in touch with all of the station news and opportunities, contact ani, and ask to be added to the volunteer email distribution list.